Preparation of the concrete surface by diamond grinding: Because the products we use are penetrators and not merely surface applications that can chip and peel, the concrete must be prepared to allow absorption. This is done by creating a profile with diamond grinding heads. In layman's terms, we're basically opening the surface pores, which allows the coatings to wick deeply into the concrete, creating a permanent bond. Crack and/or concrete repair (as needed): Cracks are opened up with a V shaped diamond wheel designed specifically for that purpose. Opened cracks and areas in need of repair are filled with an engineered grout and are then ground smooth. Filling expansion joints (optional): Ultimate Garage has developed a proprietary system of filling expansion joints while preserving their ability to function. Joints are filled with a flexible material that is able to expand and contract with temperature changes, resulting in a seamless, functional surface. Coating foundation stemwalls (optional): The junction of the foundation stemwalls and concrete floor is caulked, creating a water tight surface. The stemwalls are then coated, typically in the same finish as the floor. Application of a penetrating pre-primer: Imperative to the longevity of your floor coating, the use of a deep penetrating primer ensures just what its name implies...deep product penetration and a permanent bond. Older, high density or poor quality concrete may require a specialty primer that not only adds integrity to poor quality concrete, but locks in contaminants and ensures adhesion. Application of a penetrating tinted epoxy base: Yes, another penetrating product. An epoxy base coat is tinted to coordinate with the predominant color in the blend of paint flakes chosen. Broadcasting of vinyl paint flakes: This is a FULL broadcasting of paint flakes, NOT a light sprinkling. Depending upon the color formula you select, we average broadcasting 50 pounds of paint flakes for every 500 square feet of flooring installed and strive for no less than 95% coverage of the tinted epoxy base coat. TWO topcoat applications: Topcoat selection is based on several factors including how a client will be using their floor, the degree of sheen they desire and the environmental conditions their floor will be subjected to. 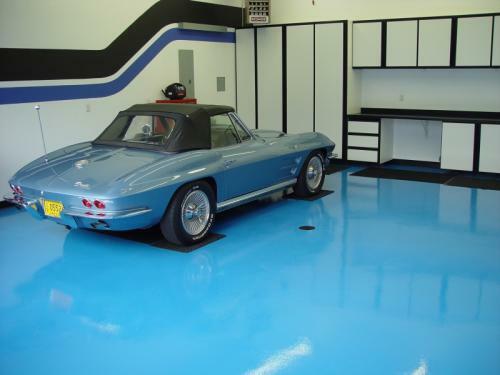 While other coatings companies only apply a single topcoat, Ultimate Garage has developed a proprietary two coat system that incorporates an epoxy sealer with polyaspartic or a waterbased polyurethane, two of the finest finishing topcoats on the market today. This unique combination of topcoats delivers a deep, rich and uniform finish with the additional protection that a single topcoat simply cannot provide. 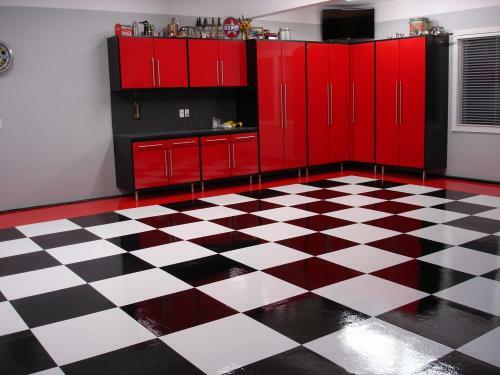 The end result is a durable floor coating with impact and chemical resistance and a luxurious look and feel.